Salisbury Transport Management Organisation (SALTMO) was set up to work with local businesses and the community to improve travel options to access shops, workplaces and education. To help promote the free 505 Bus campaign to run consistently over several months. The marketing materials needed to be consistently branded but with fun and creative lead images and focus to generate interest in the 505 bus offers. As SALTMO developed partnerships with local businesses to provide offers, we worked with varying brands, incorporating them into the leaflets and flyers. The leaflets developed over a year with a new one each month being produced for door drops and delivery to relevant retailers. Each leaflet was designed to be in keeping with a look and feel but distinctive enough to highlight the themes which led that month’s campaign. We had some fun developing images and working with SALTMO on these fun leaflets. 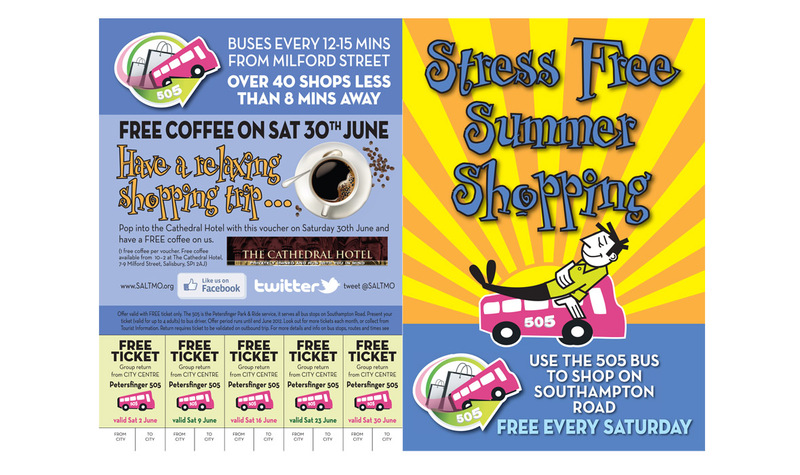 We approached Addison Design to produce our logo for the promotion of the Salisbury/Southampton Rd 505 bus service. We also required a marketing leaflet to advertise this new route and to distribute the free tickets. The team at Addison proved to be adaptable and creative in their approach, providing an engaging leaflet design whilst maintaining the focus on our message. As a result we asked them to create leaflets for the whole campaign – each leaflet being themed on a specific promotional offer from a local business or leading supermarket. The project continued for over a year and was an overall success. Addison Design always responded quickly to our needs, often under time restrictions. I would recommend Addison Design as an agency with the ability and experience to implement impactful and creative marketing campaigns.